COMMENT: A minor political row over a web comic may look like a stupid storm in a teacup – but we must speak out before it becomes acceptable to arbitrarily censor art in the name of religion again. Those of you who know me will know I have opinions on all things politics and current affairs. But I generally keep those opinions out of this blog because they don’t belong in something about theatre and arts. But one issue that is relevant is the issue of censorship. Now, I’m not one of those people who dogmatically opposes all kinds of censorship. I could certainly see a case for stepping in if a book, film or play was being used as as a means of provoking hatred against people of another race, religion or nationality. But the one thing I do not accept as a valid reason for censorship any under circumstances whatsoever is that someone found it offensive. It’s quite simple: if you don’t like to look at it, don’t look at it. End of. No arguments. But lately, the idea has started catching on that censorship is okay if it’s over offending someone’s religious sensibilities – and this is becoming an absolute menace. And nothing is more disproportionate than the idea that all Muslims find depictions of the prophet Mohammed offensive. Something like this first came to prominence in 2005 with some Danish cartoons, one of which ill-advisedly likened Mohammed to a suicide bomber, but the furore wasn’t over equating Muslims with terrorists – it was over drawing Mohammed in a cartoon. Now this is getting out of hand that the latest target is the picture above. 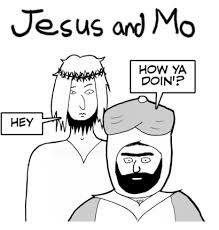 Now, it you’re wondering what fuss is about, Jesus and Mo is a web comic that pokes fun at religion, particularly the views of some of the more hard-line Christians and Muslims. I have not checked this strip in detail so I can’t vouch it isn’t racist. For all I know, there might be a theme throughout the strips to apply negative stereotypes to Muslims, but this uproar isn’t over applying negative stereotypes to Muslims. It is about a picture of Mohammed saying “How ya doin?” Grief, you couldn’t draw a less offensive picture if you tried. Small bit of news from the relatively obscure Fringe scene down at Oxford. This may seem trivial, but this potentially sets an important precedent throughout the world of Fringe Theatre. So, the news is that that Oxfringe is no more. Stepping forward its place on a permanent basis is Oxford Fringe. And chances are most of you reading this are wondering 1) what’s the difference, and 2) why does this matter?